Our promise to you is a fast, reliable answer to your relationship question, using the latest DNA technology. Whether you’re looking for a peace of mind paternity test, a legal test for a court hearing, or a test for immigration purposes, we’ll deliver accurate results to you quickly and discreetly. Our tests are amongst the most affordable in the UK, with our paternity test for alleged father and child starting at just £99 with NO HIDDEN FEES. At Who’zTheDaddy?™ we also understand the importance of having results that you can trust and depend on, this is why we place so much importance on the quality control standards of the laboratory. We test 21 genetic markers to maximise the accuracy of your results. All Who’zTheDaddy?™’s DNA analysis, paternity testing and DNA tests are carried out at a laboratory accredited by the AABB and accredited in accordance with the recognised International Standard ISO/IEC 17025:2005 by a signatory to the ILAC arrangement. View the full list of Signatories to the ILAC Mutual Recognition Arrangement which includes The United Kingdom Accreditation Service (UKAS). With a 99.99% accuracy, our 21 genetic marker test will provide you with indisputable answers to some of the most sensitive and personal issues, all dealt with professionally and in absolute confidentiality by our experienced staff. Paternity testing starts at just £99 and you can have the results within 4 days so why not order your DNA test kit now and take the first step towards finding the answers you seek. Contact us with any questions. Your DNA test results will be available to download from our website 4 working days after we receive the samples together with the completed forms. Peace of mind DNA results are also available by telephone, email or post. Our experienced customer service team can assist you with every step of the process, whether it be answering questions about the type of DNA tests and methods of sample collection, or providing you with advice and support. Who'zTheDaddy?™ is a leading DNA paternity testing company providing results that are reliable and fully accredited. Not only do we offer tests at great prices and in the quickest time frames, but we also have a convenient and easy online results pick up system. The moment your results are ready, you can access them on our site – no need to check your inbox, wait for an email or a call. All our parental tests and relationship DNA tests have a turnaround time of only 4 working days from receipt of samples at our office. We also know that our clients need results quickly and in total confidentiality. Your privacy is paramount to us we ensure peace of mind as you and only you will receive the results, third parties who ask for copies of the results will not have access to them. Getting your test done and collecting your samples couldn’t be easier, following our 4 easy steps that will make this process simple, fast, efficient and problem-free. All our DNA sampling kits are sent out in the post in plain envelopes marked Private & Confidential and with no branding on them, so it will look just like a normal letter. Who'zTheDaddy?™ offer paternity testing and relationship DNA testing – but these are just some of the tests we offer. Our clients come to us with all kinds of relationship queries and we can answer the vast majority of these thanks to the diverse portfolio of DNA testing and paternity testing services we offer. We provide peace of mind DNA tests – quick and easy tests to help you get rid of those niggling doubts - as well as legal DNA tests. If you have a court case and need court admissible results, our legal tests are just what you need in order to have the scientific proof of a relationship you can present in court. Besides our standard tests, we also have available some DNA tests which are based on cutting-edge technology. We offer non-invasive prenatal paternity using blood samples at the early stages of pregnancy. We also offer advanced forensic testing methodology which mean we can test a multitude of samples such as hair samples, tooth brushes, blood stains and many many more. 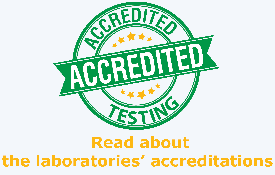 We value your trust and our accreditations are proof of our state-of-the-art laboratories, in which your tests are handled by a highly qualified team of professionals. The margin of error for our tests is negligible and this should keep any worries you might have at bay. I posted the samples on Monday and received my results on Friday. I now know I am the father of a beautiful baby girl. Thank you for your fast efficient service and would certainly recommend you to anyone who needs the peace of mind that I needed. The service are excellent, friendly staff!!! Very happy with the service... Hopefully not needed again... Just found out I'm a Grandma for the first time !!!!! So a really good outcome too. Thankyou. Completely satisfied with WTD service. A brilliant company to use and very informative. Very swift service and clear instructions. Very easy to do just disappointed it wasn't the result we wanted but we have the results now. Thank you. Very fast deliver of the test kit. And very fast results and easy to understand and read would defiantly recommend the company of someone needed a DNA test. I am very pleased with the personal service I have received throughout the process and the results were easy to understand. Many thanks. "Not the result we had hoped for but fast delivery within the timescale and easy to understand the results." Was very grateful for your service and how it was handled from start to finish. Very happy with the service. You did everything you promised on your website. Results came in bang on schedule and you kept me informed when you received my samples but were still waiting for the other party. Overall completely satisfied. I'm really happy deal with you. Happy to have quick test results. Happy with quick answers on my questions. Thank you so much. A great service clear and precise 29 years of not knowing all come to a conclusion and a positive one at that thank you for a fast response. Fast quick and very reliable couldn't have asked for better help and support. Very efficient service and quick turn around time. All round good service. I was very happy with the speedy results. I was very happy with the service I received & the test & results were easy to complete/understand. Great customer service & results ready as promised early on the day stated.Would recommend to anyone. Very quick service provided and was really happy with the turn around. results were delivered faster than the time given. however very satisfied due to the fact I was kept in contact throughout the hole process. Very quick delivery and results. Would use again if needed to. Excellent service and value for money. The tests were easy to follow and all paperwork received was most explanatory and understandable. Results were received a day early and I was informed by email of when samples had been received and a date for results. Would definitely recommend your services. Thank you. Very quick service. My mind is now at peace. Thank you very much. The service was first class with result dates being adhered to and everything went like clockwork. Excellent! Call advisers were very helpful and contact via email was always professional. Thank you for your services. Amazingly fast and kept me up to date with what was going on. Absolutely brilliant service reasonably priced and very well explanatory on receipt of results recommend and purchased by a friend also. Professional, honest and trustworthy. Highly impressed with service received. Very professional service with support.